“They say that the cure for love will make me happy and safe forever. And I’ve always believed them. Then, at last, they have found a cure. This book was one of the few that caused the tears to cascade down my cheeks. Of course when you hold the title “Most Heartless” this is somewhat of a big deal. The name “Lauren Oliver” has been added to my list of authors whose books have really changed something within me. Oliver’s writing style captivates the reader, provoking her thoughts, and unleashing her imagination. The beginning of “Delirium” is kind of slow paced, mostly background information, but trust me when I say it’s worth it, it definitely not your typical disutopian novel. So we’re deleting ‘Love’ from the equation of life. After all, it is what’s holding us back, isn’t it? A world without ‘Love’, is it really worth living? *thumbs up* one of the best books I read! I’ve read all Lauren Oliver’s books (waiting for the new ones now) and truly her writing captivates readers. Even her books for children is fascinating! 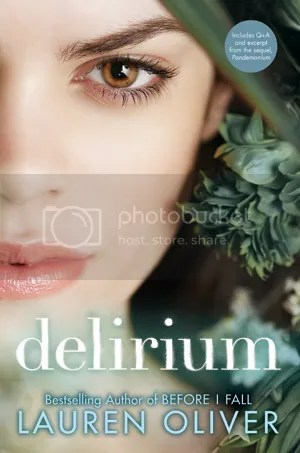 I do, also, recommend Delirium and her other books. This is on my list of “must pick up for next time”! Read great things about Lauren Oliver, and this trilogy too. i read the whole trilogy. it’s absolutely brilliant! one of my favorites.